It’s not uncommon for people to have a missing tooth, especially once they get into their middle years. Statistics actually show that over half of American adults between the ages of 35 to 44 have a missing tooth. This missing tooth is typically due to a fracture, an accident, gum disease, or tooth decay. Thanks to the advances in dental health, you don’t have to go through life not smiling or having issues eating because of missing teeth. There are two options open to you. 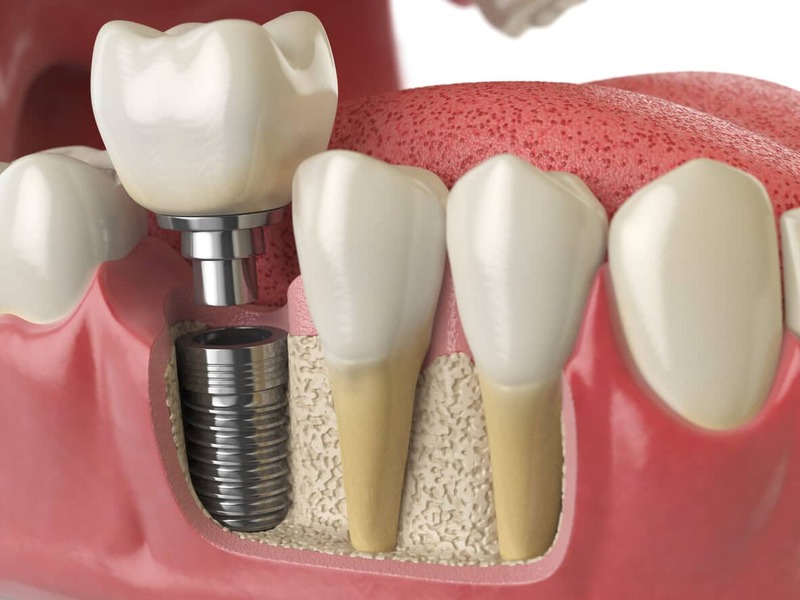 The problem is examining implants versus dentures to determine which is your perfect solution. They both have their positives and their negatives. In fact, what’s right for one person may not be right for another. Let’s break this topic down to help you in making your decision. Dentures are false teeth that are in a device that secures into your mouth using a denture adhesive. The dentures can be either a full set of teeth or a partial set to fit the areas that are missing teeth. A dental implant, on the other hand, is a replacement tooth that’s surgically inserted into the jawbone. The implant contains a screw attachment. They mimic your natural teeth. Implants can last for at least 20 years if you care for them correctly. They both offer the benefit of having a full set of teeth. This benefit can do wonders for a person’s confidence levels and change their entire outlook on life. There is no worry about how your smile looks. You don’t have to deal with potential eating problems that missing teeth can sometimes cause. Dentures have a few benefits. The first is that they are typically less expensive for people that have missing teeth than dental implants. Dentures are also providing an option for people that are unable to have dental implants. If your gum or jaw is not healthy or strong enough for the dental implant implantation surgery, you’re not an eligible candidate. Dentures are your answer in this circumstance. Dental implants have a few benefits. One of the biggest in the implants versus dentures equation is that this is a long-term solution to your missing teeth. You don’t have to worry about them falling out or not fitting correctly. As long as you care for them correctly, they will last for 20 years or more. This implant is also a great option when only one or two teeth are missing. Partial dentures can sometimes be uncomfortable if the fit is not just right and they can rub against the healthy teeth that anchor the partial. There are some disadvantages to having either of these options. The main problem of dentures is that they have to fit just right or they can be uncomfortable. If something goes wrong in the process of making them, the person may end up not wanting to wear them because of this discomfort. In addition, problems with the way partials are made and fit can have an impact on the health of the surrounding teeth. Another disadvantage is that they do come out, and if not secured well, they can come out when you don’t want them to come out. There are also some disadvantages to dental implants. The biggest disadvantage is that not everyone is a candidate to have this procedure done. It can be very frustrating to want new teeth implants and to be told that your jaw is not healthy enough for them. Another disadvantage, especially when it comes to having several teeth put in is that this can be more expensive than a denture. Implants Versus Dentures: Which Situation Is Best for Each One? When it comes to determining implants versus dentures for your life, there are a few things that you need to consider. One is the cost. In many circumstances, dentures are going to be the less expensive option up front. However, in a situation where the dentures don’t fit properly, this could cost more later on. Another thing that must be considered is your overall dental health. As implants are embedded into your jaw, having issues with your jaw bone or gums may make it impossible to have the dental implants put in. Your dental professional can be an excellent source of information when you’re trying to make your decision. They can lay out your personal options that fit your dental health and financial needs. Ready to learn more about these potential solutions for your smile? Contact us at McCauley Dental to discuss your dental health. Our professional staff can go over which option is best for you based on your current situation. Implants are lovely for some patients, but dentures may work better for others. Make an appointment today to learn more.